Ms Angelika Dimböck, a German language teacher, conducting a German course at NTU's language laboratory. Picking up a European language may not seem like an activity a visitor to Asia would have on their to-do list, but many European students are choosing to do just that at NTU. According to the Centre of Modern Languages (CML), there has been an increase in the number of European exchange students taking European language modules here, such as Russian, German and Italian. For instance, German language classes saw 18 European exchange students last year, an increase from 10 students two years ago, according to German language course coordinator Patricia Lorenz. Some of her students come from countries like Slovakia, Sweden and Netherlands. Ms Lorenz, who is also the chairperson for publicity at CML, said she expects this number to rise to more than 20 this semester. The Italian classes had 14 European students last semester, an increase from six students the previous semester, said Italian language course coordinator Ariana Caruso. 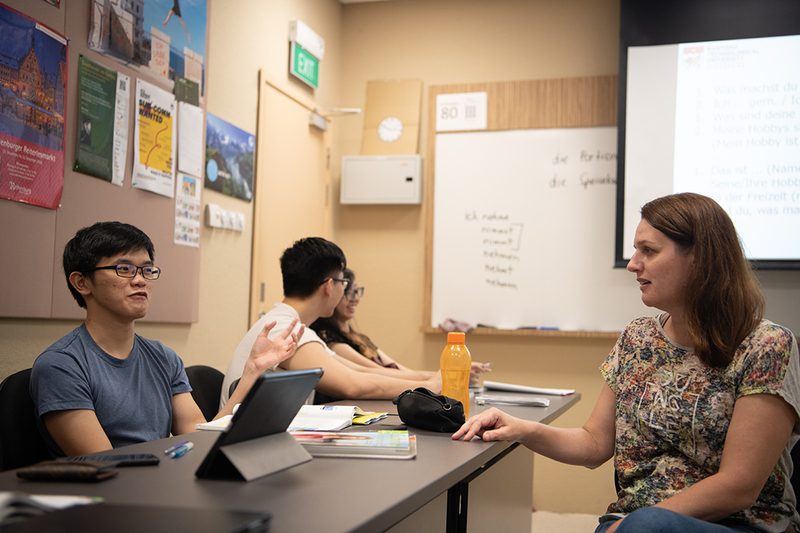 Some exchange students the Nanyang Chronicle spoke to said they were keen on taking language modules here as they were unable to take them in their home countries. There are no foreign language courses at Amanda Gustavssol’s university back in Sweden, and this prompted her to take up both French and Spanish language classes while on exchange. “It is not an option at home as all my classes are core classes. Language courses are available only in private schools, so it would be very expensive to study,” said Gustavssol, 23, a third-year Nanyang Business School (NBS) student. Ms Lorenz said that many European students find learning these languages useful in expanding their career prospects in Europe. “With globalisation, language becomes very useful to have and gives you an advantage. Employers in many countries are likely to ask how good you are at the local language, and preference will be given to someone who knows it,” she said. Exchange student William Thorne, 21, who is from the United Kingdom, said he took the German language module as he intends to live in other parts of Europe in the future. Swedish exchange student Maxamed Duran, 22, was also keen to learn German as he plans to do an internship in Berlin next year. The third-year School of Mechanical and Aerospace Engineering student said: “While it’s not a requirement, it will probably enhance my career development in the European market. Many of the companies I hope to work for have some connection to Germany”. Ms Lorenz acknowledged that there may be an issue of students who are already proficient in a language taking the modules, but said there are sufficient measures to prevent this. All students must sign a declaration that they have had no prior education in the language of study. They are also required to sit for a placement test before receiving approval to attend the class. “If they claim that they haven’t had previous experience, and they come to class and teachers recognise the student knows the language well, they will be pushed to higher levels,” said Ms Lorenz. 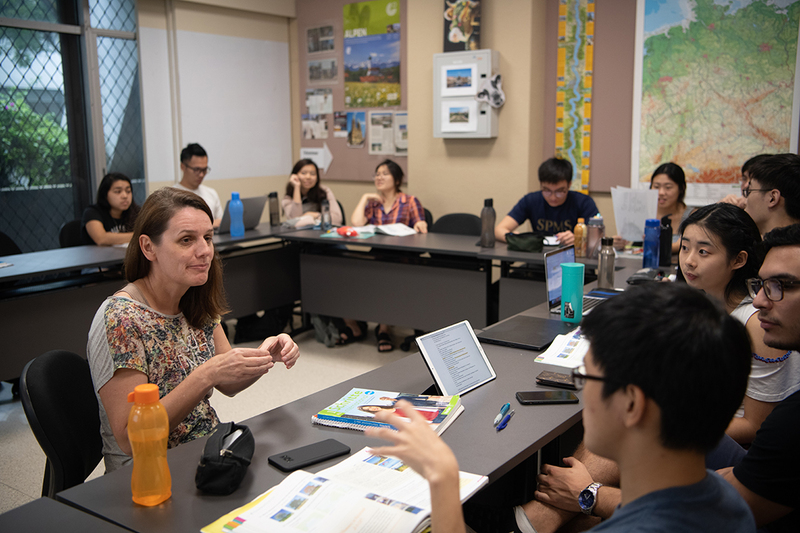 While it is impossible to replicate the experience one might have if they were based in the country from which a language originates, Ms Lorenz said tutors do their best to immerse students in a foreign culture. Gustavssol said her tutors in her French and Spanish classes think of creative ways to bring the culture to class. Tutors have brought local snacks and played music popular in the language’s country of origin, she said. Third-year Wee Kim Wee School of Communication and Information exchange student Leonie Bruckner, 25, from Sweden also appreciated that her Spanish language tutors, who were from Spain and South America, could share their experiences from home. Ms Lorenz said culture and language go hand in hand. Ms Dimböck giving feedback about her students' presentations.